It is Mrs Hillary Clinton who should be in prison, not Julian Assange. 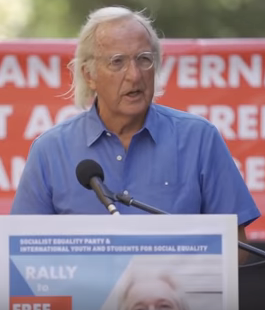 For anyone who is still confused about what on earth Wikileaks has demonstrated about Hilary Clinton, watch this very clear interview by Australia's most famous independent Australian journalist, John Pilger and check the transcript below the video. Assange makes perfectly clear the association between Saudi Arabia and ISIS and Saudi Arabia and the Clinton Foundation. It shows that Hillary Clinton, whilst Secretary of State (! ), knew and knows that the Saudi Arabian and Qatar governments were and are funding ISIS. This relationship with terrorism has been going on for years. The Australian Government and opposition must also know this. And, the Australian government, by not getting Assange safely back home is spectacularly failing its obligations to protect its own citizens from persecution. Our government is a cowardly lackey to the United States and the opposition and the Greens are just as bad because they say nothing about this. Our press protects this collusive silence. Assange is without doubt a courageous world figure and an Australian hero, but without Australia's intervention, Assange risks being thrown into a dungeon, like Chelsea Manning - with a mockery trial in the United States, should he step outside the Ecuadorian Embassy. Transcript inside, first published on RT at http://on.rt.com/7ty5 as "Assange: Clinton is a cog for Goldman Sachs & the Saudis (John Pilger exclusive video & transcript)"with multiple pictures and links which we have not published here. "Propaganda is most effective when our consent is engineered by those with a fine education - Oxford, Cambridge, Harvard, Columbia -- and with careers on the BBC, the Guardian, the New York Times, the Washington Post. These organisations are known as the liberal media. They present themselves as enlightened, progressive tribunes of the moral zeitgeist. They are anti-racist, pro-feminist and pro-LGBT. And they love war. While they speak up for feminism, they support rapacious wars that deny the rights of countless women, including the right to life." John Pilger. John Pilger on John Pilger on Paris, ISIS and Media Propaganda - Interviewed on "Going Underground"
Video inside:One of NATO imperialism's greatest chroniclers, Australian award-winning journalist and filmmaker, John Pilger, tells us how Washington, London and Paris gave birth to ISIS. Read more about John Pilger on John Pilger on Paris, ISIS and Media Propaganda - Interviewed on "Going Underground"